Your front door and our back door are critical parts of your home’s security. It is very important that you keep both of them as secure as possible. We are sure you probably haven’t given much thought to your door security, beyond the lock that is. When it comes to door security, there is a lot to think about. This includes how you use your door, how others use your door and the risks your doors face. One of the best ways to keep your door better secured is by understanding the risks you are facing and hope to avoid. 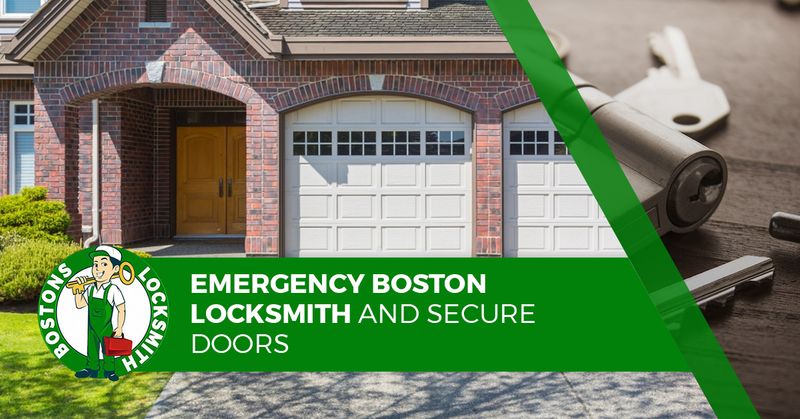 Bostons Locksmith, your emergency locksmith serving Boston, recommends that you complete a risk assessment to get an idea of your level of protection. Here are a few things to consider when thinking about ways in which you can keep your doors more secure. Cutting at your door is a popular way thieves break into houses that have a deadbolt. If you have a cheap lock that you bought at Walmart, cutting through it can be quite easy. In fact, not only is cutting a cheap lock easy, it can be done in very little time and by someone who has a hacksaw. Keep this in mind when shopping for locks for your doors. Picking locks to gain access is somewhat outdated. Quality modern locks are quite difficult to pick. But if you have an older lock, you could be vulnerable. Again, take this into consideration when shopping for new locks. There are several ways in which somebody can choose to gain entry into your home, using a drill is a common choice. Drills are quite easy to obtain, portable and have very powerful batteries, you can hide one in a backpack and nobody would suspect a thing. The reason why using a drill to break into a home is so popular is that you don’t have to be an expert on locks to get the job done. Another popular way to break into a home is simply by kicking at the door or using a battering device. These are violent ways to gain entry and can be used by anyone. You don’t have to know anything about locks, just use brute force. This method of breaking and entering will often compromise not only the door, but parts of your home as well, like the siding and hinges of the door. The best way to prevent such a break in is to determine ways to keep your doors more secure. There is a serious flaw in your security system if it takes little effort to bypass your secure doors. The most common way to bypass a door is by using a credit card or similar device to release the lock. You need to look for ways to make sure this can’t happen. As a Boston MA locksmith, we know the importance of home and business security. As a commercial and residential locksmith, we can assess the locks on exterior and interior doors and windows to secure your building and property. Call Bostons Locksmith today.